dc engineering - specialist dairy and electromechanical engineers / contractors. dc engineering are Dairy Engineers, based on the Isle of Wight, in the United Kingdom, specializing in the supply, installation, commissioning and maintenance of milking parlours and milking equipment. We carry a large stock of milking machine spares, and spare parts for milking machines. We also supply, install and maintain most electro-mechanical / electro-pneumatic systems used in farming and the milk processing industries. dc engineering (dce) was established in 1987 by Shaun Wheeler, and is dedicated to serving the dairy and milk processing industries. We are on call for emergency work 24-hours a day, 365 days a year, and you can be assured of our best attention at all times. We are able to carryout most jobs connected with the dairy industry, from minor breakdowns, through plumbing, servicing, certified maintenance and testing, updates to existing parlours and systems, complete installations in existing or green field situations from the design and planning stage, to building and project management. We are able to offer an Isle of Wight based full scale electrical contracting service, including design, installation, inspection and testing, and naturally, all work is guaranteed and carried out is to BS7671. We specialize in Agricultural Installations, including pumping systems and grain drying, but also have vast experience of Industrial and Commercial Installations. PAT Testing (portable appliance testing) is another of our specialist services offered. Clients benefiting from our expertise include MHI Vestas Offshore Wind, Vestas Technology, GKN Aerospace Services, Doncasters Trucast, Havenstreet Railway, Wight Salads Group, Staples, and dc engineering are the Isle of Wight Electrical Contractors for Harrington Generators International, providing 24 hour emergency back up to the major players in the mobile telecommunications industry. For small holdings and smaller farms, we offer an excellent range of portable milking machines and milking trolleys for milking cows, sheep and goats. Click on the picture below for more details. dc engineering specialise in DeLaval Milking Parlours and as well as supplying and installing complete systems for milking, feeding, slurry, herd management and milk cooling, we can supply spare parts for DeLaval milking systems, out of parlour feeding systems, in parlour feeding systems, bulk milk tanks, wash down systems, dairy sundries and chemicals. We are able to supply other makes of equipment the world over, but sometimes the cost of carriage makes this prohibitive..
dc engineering supply and install most types of light fittings, (including corrosion resistant sodium, halogen, fluorescent, tungsten and mercury halide) along with sundry lamps. We supply and install commercial equipment for heating, ventilation and electronic pest control. dc engineering offer the complete range of Loheat Dairy Water Heaters at very competitive prices, delivered straight to your door by carrier, usually within 48 hours of receiving your order. dc engineering offer the complete range of Davlec milking parlour feeding equipment at very competitive prices, delivered straight to your door by carrier, usually within 48 hours of receiving your order. dc engineering are fully qualified Portable Appliance Testers (PAT Testing), and can offer special rates for regular contracts. dc engineering supply and fit starters, motors, pulleys, drive belts and couplings, armoured, flexible and welding cables along with all other wiring accessories. dc engineering supply dirty water systems from Ocmis, Ameram, Briggs and Agripumps, Processing equipment from Read-Desco. 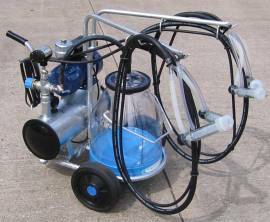 We supply dairy accessories from Ambic Equipment and Diversey. dc engineering offer a welding and fabricating service for those one off items or repairs. dc engineering can supply and repair augers, conveyors, grading equipment and all types of potato handling equipment. dc engineering can supply, service and repair mill/mix, roller mills and home mix equipment. dc engineering can supply, service and repair most types of clean water pumps and pumping systems, and dirty water pumps, including Balmoral anaerobic digestion systems. dc engineering can service and repair vacuum packing machinery, bottling equipment, and most food service industry equipment. Recent high profile diversification projects include contracts for the famous Isle of Wight Cheese Company, Calbourne Classics, Briddlesford Lodge Farm Shop, Queen Bower Dairy and CHF Wight Milk. We are able to provide the necessary documentation for farm audits, and are on hand to advise and carry out any necessary works that may be necessary. We can help with COSHH assessments and Health and Safety plans, all of which can be regularly review once they are stored on our database. We can carry out electrical inspections and testing, to provide you with the reports necessary for insurance companies. You can buy spare parts for your milking machines on-line from our farm store by visiting here. Milkingmachines.co.uk can supply Gascoigne Melotte milking and feeding systems along with the full range of consumable and breakdown spares, and the full range of products from Kingston Somerset. They can supply milk meters and pulsation systems manufactured by Waikato. We are sales and service agents for bulk feed bins, auger systems, and feed systems supplied by E.B Systems, Sowesco and Collinson, auto identification systems, out of parlour feeding systems and in parlour feeding systems from A.T.L., water heaters and tank washers from Cotswold, tank washers, milk filters and hygiene products from Diversey Lever, bulk milk tank spares and water heaters from Fabdec. Milk Bar calf feeding equipment is available, and can be delivered direct to your door. We hold a data base of second hand milking and feeding equipment available for sale, and we can buy and sell your milking parlour or milking equipment on a commission basis if required. If there is anything you need, please email us with your requirements. We can quote for the supply only of any components or spare parts you may need. Just ask for a no obligation quotation. If you need milking machines, or spare parts for milking machines, please contact us. We can supply spare parts and sundry items by post or carrier in needed, and arrange for the sale and of larger equipment be it new or second-hand. Subscribe to our news letter for offers and second hand equipment for sale and wanted. Address:- Lamas Lodge, 402 Fairlee Road, Newport, Isle of Wight PO30 2JX. dc engineering provide support and backing to the first 'live' network of weather stations on the Isle of Wight. Data is uploaded in near real time onto the Isle of Wight Weather websites, which can be seen at Newport, Brighstone and Bleakdown. We also support a lightning detection system which monitors storms in near real time, and is the most popular resource in the South of England. The Isleofwightweather equipment consists of a 2 x Davis Vantage Pro 2 automatic weather stations, a Davis Vantage Pro 2 Plus with FARS and a Boltek PCI StormTracker lightning detection system, providing valuable information for the local community. Copyright dc engineering 1987-2018. All copyrights, trademarks, service marks, and logo's are the respective property of their holders. This site may not be copied without the written consent of dc engineering. All text that is intellectual property is copyrighted. Images and our Logos are copyrighted and may not be reproduced in any way without the written consent of dc engineering. This site is maintained by Shaun Wheeler. and was last updated 12/08/2018. dc engineering is listed in agsites.net. We record weather conditions and data on the Isle of Wight which can be viewed at Isleofwightweather.com and Isleofwightweather.co.uk. Milking machine spares and spare parts for milking machines can be found in our online shop here. Loheat dairy water heaters can be bought online from us here. We also sell weather stations and weather recording equipment.